Kayam churna Tablet is a very famous Ayurvedic medicine for constipation. It is not a traditional Ayurvedic medicine. It is a proprietary Ayurvedic medicine. It means that the formula of Kayam churna is not mentioned in any Traditional Ayurvedic text books. The manufacturer of Kayam churna Tablet– Sheth Brothers, formulated a combination of few Ayurvedic herbs that benefit in constipation, blended them into powder form and labelled it as Kayam churna. Kayam churna Tablet Ingredients - Kayam churna is a powerful and intelligent blend of good Ayurvedic herbs. Kayam churna tablet is claimed to be beneficial in Chronic constipation, acidity, gas, headache and mouth ulcer. 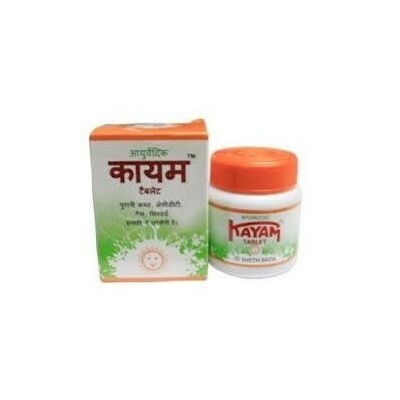 Kayam churna tablet for constipation – Kayam churna tablet is one of the most over-the-counter purchased Ayurvedic medicine for constipation. However, many complain of dependency and recurrence of constipation once after stopping the product. Kayam Churna how to use -1 – 2 teaspoons at bed time, preferably before food with half a glass of hot water. How Kayam churna Tablet acts? Trivrit is a good purgative Ayurvedic herb. Haritaki and Senna leaves are mild laxatives. Yasthimadhu is good for stomach complaints, peptic ulcers and mouth ulcers. Saindhava lavana and Swarjika kshara are usually used in gastritis condition. They also improve the digestion capacity of stomach and intestines. Very high dose of Kayam churna may cause severe stomach pain, diarrhea and dehydration.